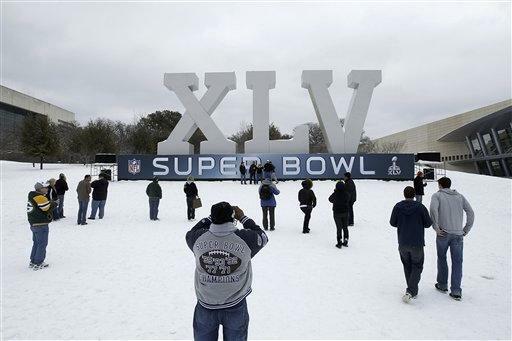 ARLINGTON, Texas (AP) - Football fans whose flights had been canceled struggled Saturday to get to Dallas for Sunday's championship game, while those already in town for the Super Bowl were contending with temperatures and snow typical of Pittsburgh and Green Bay but unusual in Texas. A fresh blast of snow and ice canceled hundreds of flights Friday, transformed highways into ribbons of white and caused dangerous sheets of ice to fall from Cowboys Stadium, sending six people to the hospital. It was enough to turn the biggest week in American sports into a Super Mess. The National Football League said those hurt by the falling ice included private contractors it hired to prepare the stadium for the game. One man was hit in the head, another in the shoulder. None of the injuries was considered life-threatening. Alison Crombie, a spokeswoman for Getty Images, said Saturday that one of its photographers, Win McNamee, also was hurt. He was flying home and would be assessed by his doctor there, she said. Most stadium entrances were closed as a precaution. Officials raised the temperature inside the arena in an attempt to melt remaining ice. The Dallas-Fort Worth area received as much as 5 inches (13 centimeters) of snow overnight - nearly twice its annual average - and by Friday morning downtown Dallas hotels were selling ski hats and scarves alongside cowboy hats. A winter storm warning was issued for suburban Arlington, home of the $1.3 billion stadium where the Pittsburgh Steelers and the Green Bay Packers are to play Sunday. "It looks like, 'Oh, no, I'm back in Canada,'" said Sammy Sandu, a 32-year-old property developer from Kelowna, British Columbia. "It's just pouring down snow. Are we still at home, or have we left? We didn't drink that much last night, did we?" Forecasters expected game day to be mostly sunny, with highs in the 40s Fahrenheit (5 to 10 degrees Celsius), which would probably not be warm enough to melt all the snow and ice. Sandu made it to Dallas with his father Thursday, but other members of their party weren't so lucky. His brother still hoped to arrive from Miami in time for the game, but a friend abandoned the trip after a flight from Vancouver was canceled. The winter weather wasn't expected to faze the teams competing in the real event, nor their hardy fans, who are used to cooler climes. The temperature in Dallas on Friday stood at 20 F (-6 C) - the same as Pittsburgh. Green Bay was slightly colder at 17 F (-8 C). "We deal with it very well back home," Steelers fan Alex Sax said on his way to the NFL Experience fan festival in Dallas. "Here, they don't know how to deal with it. There's no plows. No salt trucks. When we drove from airport, we were the only car on the road." Asked if the weather could affect future Super Bowl bids, NFL Commissioner Roger Goodell said the conditions this year have been exceptional. "We've had a winter to remember. Some would say to forget," Goodell said. "It's going to be a great weekend for us, and the weather's getting better." The Super Bowl is scheduled to be played in Indianapolis next year and in the open-air New Meadowlands stadium in New Jersey in 2014. Associated Press writers Danny Robbins, Linda Stewart Ball, Jamie Stengle and Paul Newberry in Dallas and videographer Rich Matthews in Arlington, Texas, contributed to this report.